Oita Prefecture is situated on the northeast side of Kyushu. From Tokyo, it takes 1 hour and 40 minutes by plane and 6.5 hours by train to reach the prefecture. Boasting a large number of mountains where many rivers and streams flow, 70% of Oita is covered by forests. After a day of playing golf, why not finish off with a relaxing dip in the prefecture’s many hot springs? Recognized as having the most hot springs in the whole of Japan, finding one to suit you will be as easy as making a perfectly lined up putt. Oita prefecture is steeped in rich history and there are a lot of culturally significant destinations to visit. If you’re a fan of Japanese castles, definitely drop by Nakatsu, Kitsuki, Usuki, Hiji-machi, Taketa, and Usuki all towns with prominent castles and castle ruins. Nakatsu is also famous for being the birthplace of Fuzukawa Yukichi, an illustrious scholar who is considered to be one of the founders of "Modern Japan." (His face is featured on the 10,000 yen note) Other historical religious structures and landmarks found in the prefecture include Fuki-ji Temple, Usa Shrine, Peacock Buddhist Altar Fitting and Usuki Stone Buddahas. For beautiful natural scenery, try the hiking trails in Mount Yufu and Mount Kuju. Get close and personal with wild animals at the African Safari Park and gaze at wonderful sea creatures in Umi-Tamago (sea egg) aquarium. Since Oita is the onsen capital of Japan, a visit to the prefecture’s many hot-spring resorts is a can't miss. In addition to normal water hot springs, why not try a soak in mud, sand, or steam. 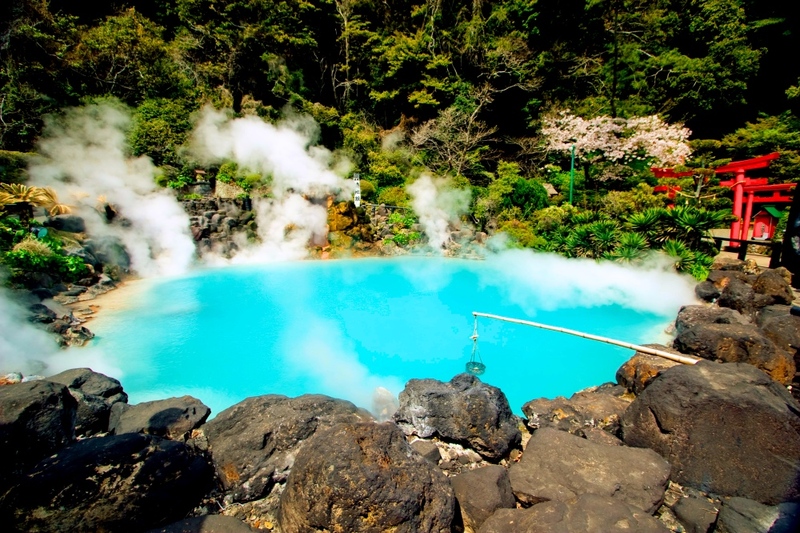 You have so many choices Oita areas with great hot spring include Beppu City, Yufu City, Kokonoe Town, Taketa City, and Hita City. Oita prefecture celebrates many fascinating events throughout the year, with February and July being the busiest months. Head out to Beppu City in early April for the popular Beppu Hatto Hot Spring Festival and Oka Castle Cherry Blossom Festival. Historical celebrations to check out are the Nakatsu Gion, HIta Gion Festival, Tenjin Festival, Tsukumi Traditional Fan Dance and Onta Folk Pottery Festival. If you have an interest in Japanese dolls, schedule a visit in February, when most doll festivals in the prefecture take place. In mid-January, Bungotakada City celebrates Horan Enya. During this event, local fishermen in their boats travel to Wakamiya Hachiman to pray for safety and a bountiful catch. One highlight of this festival is when young men bravely dive into the cold river to retrieve ceremonial gifts from spectators. Blessed with bountiful food resources, Oita prefecture has a distinctive and flavorful cuisine. With the highest dried mushroom production in the whole of Japan, Oita's shiitake mushrooms are highly prized for their size, flavor and aroma. Oita also produces the highly regarded Oita Bungo Beef, renowned for its beautiful marbling, exquisite texture and taste. For seafood, the prefecture is famous for its mackerel, blowfish, Shiroshita-Karei (marbled flounder), Hamo (conger pike), Ayu (sweetfish), Japanese spiny lobster, sea bream, oysters, softshell turtles, cutlass fish, tiger prawns, amberjack and halibut dishes. Oita churns out a variety of sake and shochu. Mugi shochu, a domestic brew, is typically enjoyed by locals with a dash of squeezed kabosu citrus. And finally, the staple dish in Oita is a dumpling soup called dango jiru and is made up of salted flour, taro, vegetables, miso, shiitake mushrooms, and edible burdock. Aside from its shiitake mushrooms, sake, and shochu, one item that you should considering bringing home is a sweet pastry called Zabieru. Zabieru was named after Francis Xavier, the first Christian missionary to visit Japan and who lived in Oita Prefecture in 1551. It is made with white sweet paste, red bean paste, rum, raisins and butter. Zabieru is customarily paired with tea. If you prefer staying in a traditional Japanese ryokan, check out Yamada Bessou. Located in the city of Beppu, this ryokan is just a short 8-minute walk from the JR Beppu Station and near my major tourist spots. Oita Rigal Hotel is in Oita City and serves delicious dishes using locally sourced ingredients. Located in front of the city’s entertainment district, the hotel is close to many restaurants and shops. Tokyo – The quickest way to get to Oita Prefecture is by plane. From the Tokyo Haneda Airport, it takes 1.5 hours and 2 hours from Tokyo Narita Airport. If you choose to travel by train, the Shikansen (transfer at Kokura) – Express (Nippo Main Line) route will take you to the prefecture in 6 hours and 30 minutes. Osaka – There are three ways to get to Oita from Osaka -- by plane, bus and ferry. Air travel, which is the fastest, takes 1 hour, while bus is 10 hours and 30 minutes, and ferry 11 hours and 45 minutes.